Wow. ApPparently there are two diffierent versions. And they are kinda complimentary. They are similar but different, yet kinda complimentary: README here explains that you have to get NU.PIF with these - while old-dos version does not have README... but have that elusive NU.PIF ! I think version 3.0 dated 1-14-1985 on old-dos seems to be close to genuine. 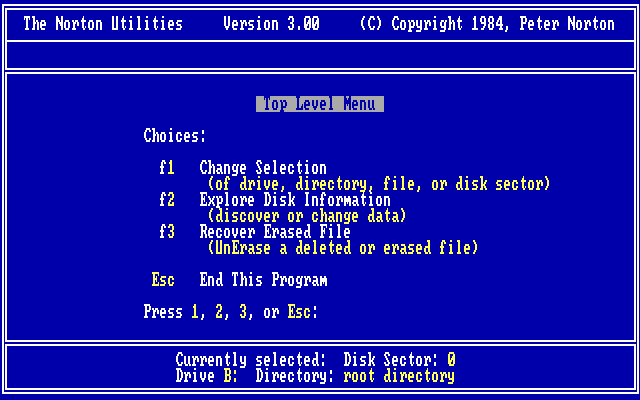 But I also doubt that version dated 1-21-1985 is dumped from original disk. Both versions have dates in files themselves (you could see them with any hex editor - there are strings "Version 3.00. dated Mon 01/14/85" and "Version 3.00. dated Mon 01/21/85" in files. Also, image on WinWordPC is made with IBM PC DOS 2.0 thus it's either genuine or some kind of extemely elaborate hoax. The fact that it mentions TopView and NU.PIF which could be found in version dated 1/14/85 but does not include that file was just a bit strange for me. But then versions 1-3 of Norton Utiltied were made by one man without rigorous Q&A team. Thus it's not improbable to see mistakes there.